During the test period and afterwards we remained pretty optimistic about its overall performance and potential. t seems to me we have already become quite used to seeing different concepts in terms of the tablet category. I am talking about interesting design decisions and innovative combinations of features. Sure, we all know the brand names that try to surprise us on a monthly basis but I am sure I have a pretty unexpected surprise for you with the one I am going to show you today. Dear tech fans, when I say “tablet” Fujitsu is probably not the first brand that pops up in your mind. But yes, the new tablet machine by the Japanese brand is called Fujitsu Stylistic M532. And during the test period and afterwards we remained pretty optimistic about its overall performance and potential. 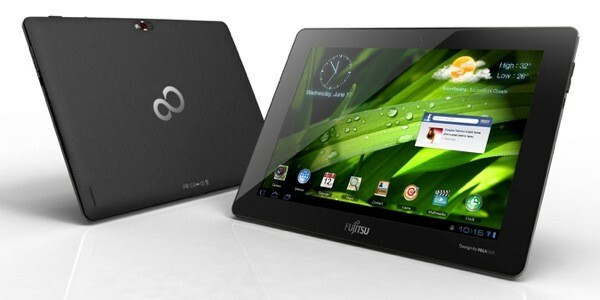 Fujitsu offer their Stylistic tablet with Android 4.0 Ice Cream Sandwich platform. The design of Fujitsu tablet catches the eye not only with its slimness of only 8.6mm but also with the classy two color back-and-red plastic surface that gives it a pretty sophisticated appearance. The rubberised back side makes it easy to grip and hard to stain. The weight corresponds very well with the overall design – only 560gr. Your interactive business and entertainment world on this TFT 10.1’’ screen is run by an Nvidia Tegra ® 3 quad-core processor at 1.4 GHz frequency. The display is FULL HD Gorilla Glass with 1280×800 pixel resolution. The operating RAM of 1GB is typical for the technical characteristics of a tablet from this class. There is 32GB SSD storage inside the Fujitsu Stylistic M532. You can share your experiences with others or capture them forever thanks to the 8MP rear—facing camera. There is also a second front-facing 2.0MP camera lens that is perfect for your video calls. As far as connectivity goes Fujitsu have provided a micro USB port, a space for a micro SIM card and a micro SD storage expansion. The lithium-polymer battery that powers the tablet provides about 9.5 hours of usage and around 8.4 hours of constant video playback. Pretty good results don’t you think? The tablet is suitable for just everyone regardless of the requirements because it perfectly meets both your business needs and keeps the boredom away thanks to the rich media features.